Wine evaluation is a smelly business. You have to rely on your nose (and mouth) to accurately identify and describe exactly what you’re smelling and tasting. It takes more focus then you may think – it’s not an easy job, but someone’s gotta do it! I’ve been thinking about writing this piece for a long time and what finally prompted the writing of it was my Rottweiler, Luke (aka “Mr. Fartyfartfart”). Do you see where this is going? OK – I was evaluating a flight of wines, really focused, then, from right next to my chair came the first unmistakable pfffffffftttttt of Luke’s odiferous offerings of the day. Then came the stench. 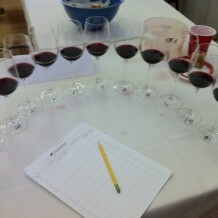 It totally threw me off of the pleasant aromas wafting from the wines I was in the middle of evaluating. “Gak!” I said, looking at Luke, who just looked a little embarrassed. It didn’t stop him from letting off another stink bomb. I made him leave the room, and then I made sure it was aired out before I got back to work. Cigar smoking. I know I’m gonna get some flack for this from my stogie-smoking friends and readers, but, come on people – you cannot seriously smell and taste wine if you or someone near you is puffing on a Cohiba. There is a time and place for cigar smoking paired with wine – some wines pair really well with cigars (like a good dry Sherry or Port), but that is more of a singular glass-and-a-puff occurrence, and in my humble opinion, should not take place at a wine tasting where wineries are trying to highlight their wines. Nuff said. Cooking. It is really hard to concentrate on wine’s complex aromas and flavors if someone is cooking nearby. This is the most difficult when the taster is hungry. This happens frequently when judging wine competitions – I’ll be sitting with my panel, plowing through the wines, and some delicious aroma sings its siren song from the kitchen as our lunch is being prepared. My stomach growls along with the other panelists as we re-focus on the wines. Cleaning. The aromas of bleach, Lysol and Mr. Clean do nothing for the palate. The wearing of perfume or other scented products. Just doesn’t work, people. TV or noise in the background. OK, this isn’t a smell issue, but it still breaks focus. Smelly dogs, cats or people in the vicinity. I know I may sound like a prima donna about this, but to me and many wine geeks like me, wine tasting is serious business, especially when I’m doing it in a professional capacity. I am blessed that I am able to do so – wine is one of the great loves of my life and I am happy to share that love with you. Please feel free to email me with questions or comments at susie.winewench@yahoo.com.